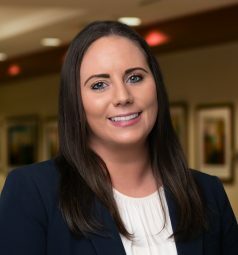 Megan Easter joined Adelberg Rudow in 2012 prior to attending the University of Baltimore School of Law. She worked as a Paralegal in the Estates and Trusts Department until June, 2018 when she was admitted to the Maryland Bar, and became an associate with the Firm. Ms. Easter’s primary areas of concentration include Estates and Trusts, and general corporate and business practice. Ms. Easter holds a Juris Doctor from the University of Baltimore School of Law and a Bachelor’s Degree in Economics with minors in English and Ancient Art History from Washington College in Chestertown, Maryland. Ms. Easter was born and raised in La Jolla, California and currently resides in the Federal Hill area of Baltimore. She enjoys participating in various sports with the recreation leagues of Federal Hill and is an avid Ravens fan. She is a member of the Federal Hill Neighborhood Association.